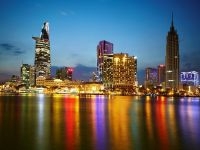 Ho Chi Minh City, the largest city in Vietnam, is divided into 24 districts: 19 urban districts and 5 rural districts. 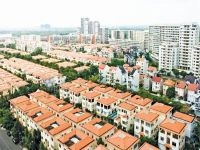 The 19 urban districts are numbered from 1 to 12 and the 7 others are named Binh Thanh, Phu Nhuan, Tan Binh, Thu Duc, Go Vap, Binh Tan and Tan Phu. Of course some districts are busier, more covered by tourist sights or conversely, more rural and jam-packed with homes and with varied nature dispersed throughout. Read on for a description of each district and get a feel for the layout of this remarkable city. We have noted the every districts that is of interest for tourists, so you will know that you’re not missing out on any place of this intriguing city! 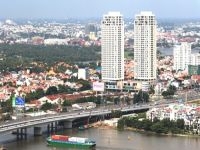 This is the financial and commercial hub- the downtown area that is referred to as Saigon, especially by its residents. The wide streets, constantly covered by locals in transit on their motorbikes, are lined with romantic trees and many buildings with French architecture. This charming old-world feel is juxtaposed by a mix of an ever-expanding array of restaurants, bars, boutiques and markets. Street stalls slinging food and supplies like raincoats dot every corner. Skyscraper buildings jut up around the streets, housing great city views, multinational corporations and more shopping. 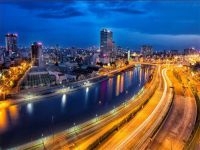 Many travelers spend the majority of their time in this district, understandably so, since a visit to the District 1 of Saigon can provide most everything a visitor is looking for. However, don’t feel like you shouldn’t step out of this region to explore day trips in surrounding areas and more temples, activities, restaurants in other districts. We suggest you do see other areas to get the full perspective of the city. 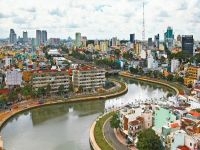 District 1 has many famous buildings and notable attractions, including: the Opera House, the Notre-Dame Cathedral, the Reunification Palace, Saigon City Hall, Saigon Central Post Office, National History Museum, Jade Emperor Pagoda, Jamia Al Muslimin Mosque, Mariamman Hindu Temple and the tallest building in Vietnam, Bitexco Tower. 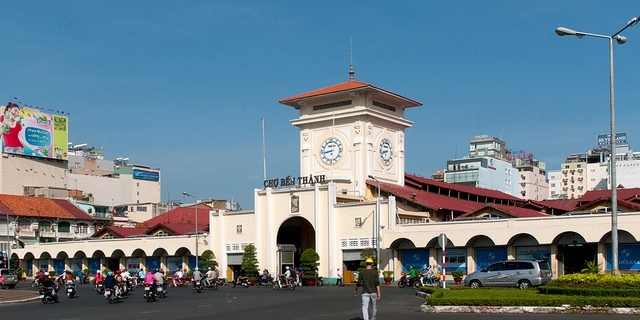 It also hosts commerce spots like Ben Thanh market and some of the most popular shopping complexes and shopping streets, such as Dong Khoi. 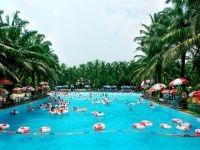 Pham Ngu Lao, the backpacker area has many budget hostels and almost all of Ho Chi Minh City's five star hotels are scattered throughout District 1, making it easy for visitors to walk around to close destinations and be right in the mix. There are various areas of District 1 that can be outlined and used as a more specific reference for finding locations and attractions. These include: Dong Khoi area, Reunification Palace/War Remnants Museum Area, Da Kao Area, Nguyen Thai Binh Area and Pham Ngu Lao Area. 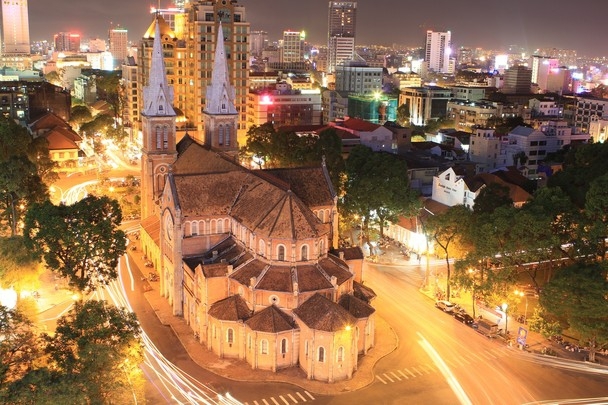 Dong Khoi area - The name of the one main shopping strips, Dong Khoi also comprises the area west of Saigon River which is (covered by) designer stores, and many embassies as it is the central business district. Le Loi and Nguyen Hue—French colonial elegance and urban modernity. 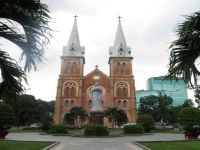 Sights: Notre Dame Cathedral, Central Post Office, Opera House, People's Committee Building, Ho Chi Minh City Museum, Bitexco Financial Tower, Ton Duc Thang Museum, Saigon Central Mosque, 22 Ly Tu Trong, Venerable Thich Quang Duc Memorial. Reunification Palace/ War Remnants Museum Area - This area straddles District 1 and District 3, grid of busy streets has Tao Dan Park and Reunification Palace…So these are some of the most popular/most visited sights…and some great restaurants Sights: War Remnants Museum, Reunification Palace, Mariamman Hindu Temple, Tao Dan Park, Xa Loi Pagoda. Da Kao Area/This is the old District 1 ward - it is North of the city center. Many consulates are here and buildings from French colonial period. 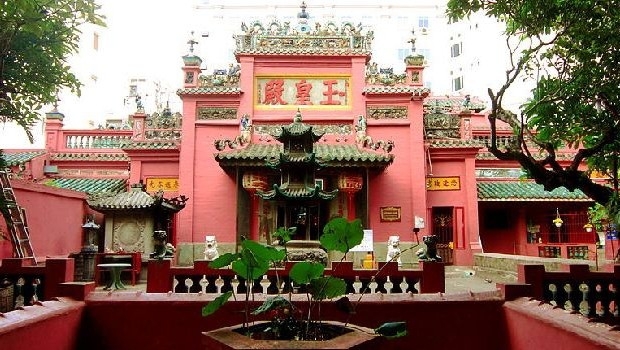 Many hip new restaurants and bars and traditional eateries are in this area and the sights include: the notable Jade Emperor Pagoda, the Military Museum, the History Museum which is on the grounds of the Saigon Zoo and Botanic Gardens. Nguyen Thai Binh Area - This is a ward that is a busy working neighborhood set in between central city, Ben Thanh Market and Pham Ngu Lao and Ben Nghe channel. Sights: Fine Arts Museum. 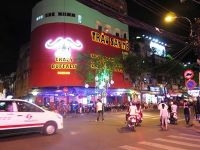 Pham Ngu Lao Area aka the Backpacker’s Area - This is Saigon's version of Bangkok’s backpacker haunt Khao San Road. Pham Ngu Lao Street is a convenient place to find cheap accommodation, food and nightlife, and not just tourists, but also locals and expats coming to hang out for a cheap and wild night to remember! Local Insight: There are bia hoi places on Cong Quynh st. and Nguyen Thai Hoc st. that make for great people watching. 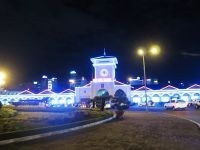 District 2, also referred to as (the names of the most popular regions of the area), An Phu and Thao Dien. This district is located about a 20 minute drive northeast of Saigon's center is setting the stage to rival D1 in restaurants and artsy venues and cafes. District 2 has rapidly become an expat haven, attracting them with modern and luxurious villas and frenetic construction which contrasts the older, poorer parts of the city. 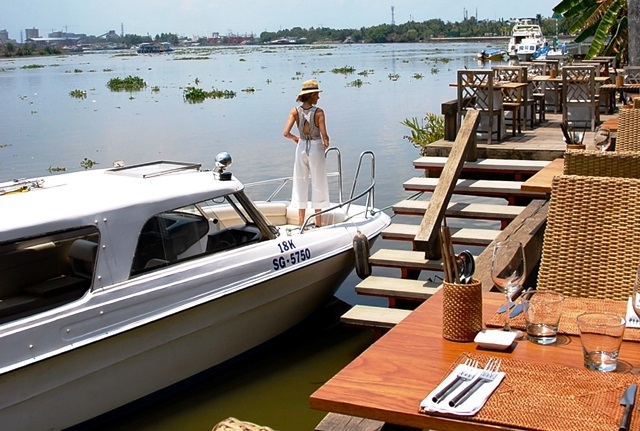 A trip out to D2 is worth it for those who want to experience some of the finest restaurants in Saigon, including the popular Mekong Merchant and The Deck, Villa Bistro, all with locations on the Saigon River. Bordering District 1, to the West, is District 3, an area both smaller in size and population, beating at an ever-so-slightly slower pace. The pace may be affected by the scenic quality created by the mature trees, the river, straddled by the winding roads, and the colonial buildings and pagodas, including the largest Vinh Nghiem Pagoda and the beautiful Xa Loi Pagoda. While in the 'hood of D3, also make sure to check out the Women's Museum, War Remnants Museum, Ky Dong Church and the Archbishop's Palace. Local Insight: Make sure to check out “Turtle Lake,” which is not a lake with turtles, but rather, a giant concrete formation in the middle of a roundabout that makes up for its lack of water with local activity at night and is popular with students and couples. Cholon (literally meaning ‘big market’), also called the Chinatown of Saigon, is mostly in District 5, West of the Saigon River and also stretches into District 6. This area not only boasts one of the largest and most popular markets, Binh Tay, yet it’s complete with a myriad of historic Chinese pagodas and temples and the most concentrated Chinese community in the country (many of whom settled in the area since as early as late 18th century). If you crave for some Chinese specialty foods, District 5 is the place to go! 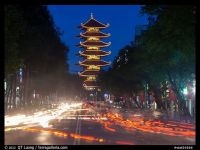 it’s also a place of great historical and cultural importance. Chinese minorities hid here from the Tay Son and subsequently had to rebuild the area twice following attack with as many as 70% estimated to have died trying to escape on boats. Those who survived settled and began selling a variety of Chinese products. 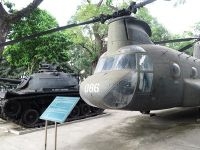 During the Vietnam War Cholon was a thriving black market for US soldiers trading in American Army issue supplies. Unfortunately, it is decidedly less Chinese than it used to be due to the anti-Chinese campaign in the late 70's when many fled the country. 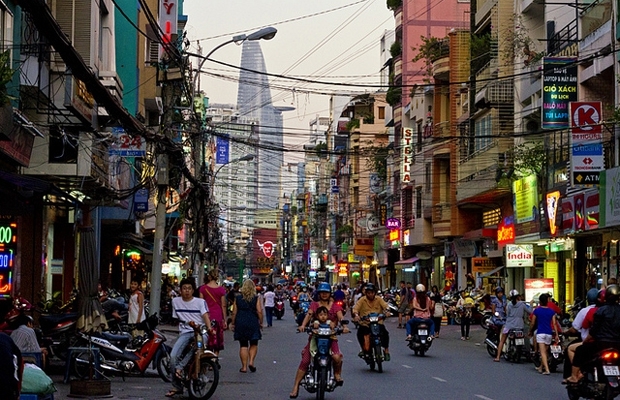 Saigon's District 5 is home to the largest market in Vietnam, Binh Tay Market, a deluxe shopping mall called NowZone and charming Chinese pagodas, including: Thien Hau Pagoda, Khanh Van Nam Vien Pagoda, Quan Am Pagoda, Phuoc An Hoi Quan Pagoda, Tam Son Hoi Quan Pagoda, Ong Bon Pagoda, Nghia An Hoi Quan Pagoda, Ha Chuong Hoi Quan Pagoda, Cha Tam Catholic Church, Cholon Jamail Mosque, and Cho Quan Church. Also discover the ancient scents and powers of traditional herbs at the shops, Hai Thuong Lan Ong Street and in between Luong Nhu Hoc Street and Trieu Quang Phu Street. You can try Chinese style noodle dishes served in this district, and if you like, add some unusual herbs or exotic foods such as dried seahorse and ‘thousand year old eggs’ (aka salted duck eggs)! Take a taxi to tour around this Chinatown by foot or take a traditional cyclo ride to make it an interesting and relaxed experience. 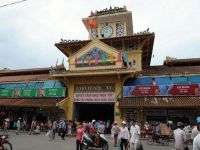 Good shoes and light clothes will help make your trip more enjoyable and comfortable, especially when visiting Binh Tay Market, as it can be hot and very crowded most of the time. Look for the clock tower and central courtyard with gardens in the market, and remember that many of the goods here are for wholesale, so it may be best for browsing. Local Insight: This District served heavily as the backdrop for Marguerite Duras' novel L'Amant (The Lover) which was turned into a movie in 1992. The area today attracts many Taiwanese and Chinese visitors and it is a popular site for all who want to experience this area which is like a small town within itself! Also known as the Saigon South Project, District 7, referred to as Phu My Hung by locals, is approximately 15-30 minutes south (by taxi, depending on traffic) of central Ho Chi Minh City. This area feels just as it has been planned to: like a bit of an alternate universe…dare say, westernized? The streets are extra wide, with median divided lanes for motorbikes, the many apartment complexes are impressive and often with pools, and the restaurants are more catered toward western style of eating. 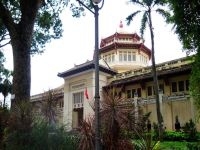 These accommodations are filled with the wealthy Vietnamese, as well as a large Korean community and a growing expat community, many of which are teachers at many of the International Schools in District 7. One of it’s leisure, shopping attractions, The Crescent Mall, is a modern mall and the area outside has a nice lake/nature landscape and a selection of upscale restaurants. 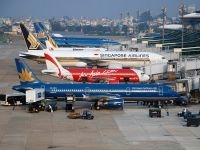 It's home to wealthy Vietnamese and expats including thousands of Koreans. Local Insight: The southern part of Phu My Hung, especially outside of the Crescent mall, is one of the best locations for a peaceful stroll; it is a reprieve for a breath of nature, or maybe a jog or bike ride. You can also enjoy a great meal at either the Australian bar/restaurant, Boomerang- which also hosts bi-monthly flea markets- or have a lovely Vietnamese meal at the well-known restaurant, Hoang Yen. This District is populated with many local families and many schools, universities and hospitals. Interestingly, District 10 follows the model that is largely used in Hanoi, where each street specializes in a particular product. For example, Le Hong Phong Street is for food spots, while Ngo Gia Tu Street is lined with stores selling interior decoration materials. 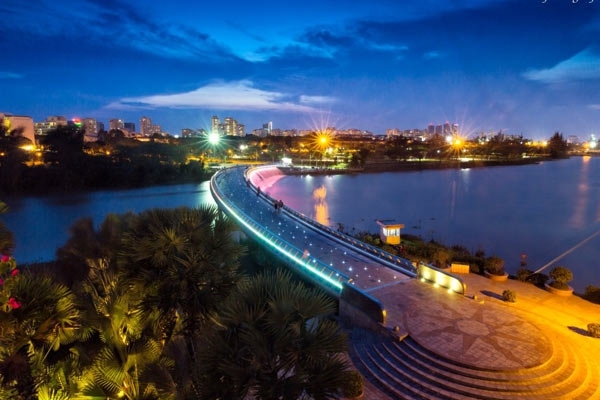 This district is not too often visited by tourists, but it is gaining popularity with working foreigners, due to the areas' proximity to Saigon’s center. 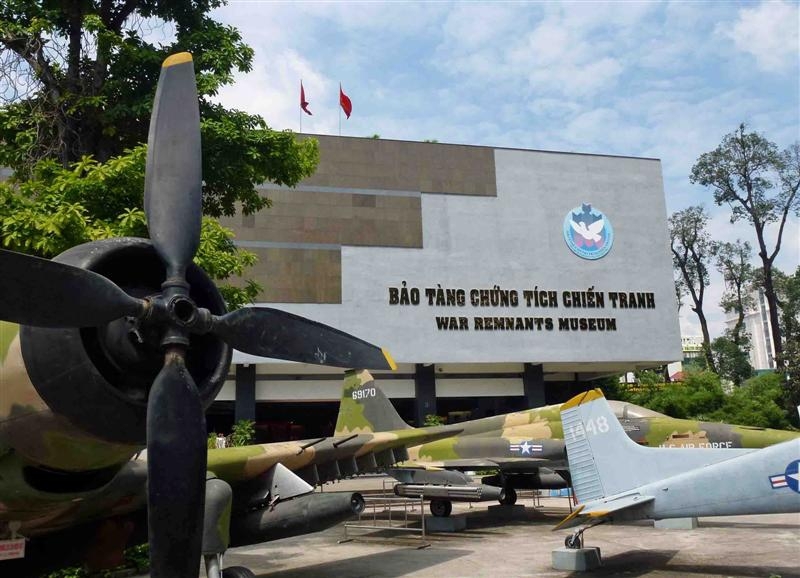 Worth visiting are Hoa Bien Park and the Vietnam National Pagoda, Fito Museum, the Flower Market and especially the Museum of Traditional Vietnamese Medicine. The Hoa Binh Opera House is also here, which is frequented by famous native artists. Local Insight: The spacious Ky Hoa Park is a wonderful place to breathe some fresh air and take a nature time-out from the busy city. Many hospitals are also in this area, including the Van Hanh location (which can process Health Check requests to apply for work permits). 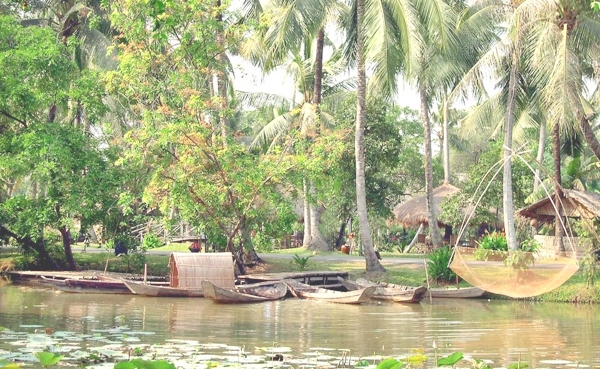 This area is West of Cholon, and it has just a couple of interesting pagodas, Giac Vien Pagoda, Phung Son Pagoda, and a the city’s best water park Dam Sen.
Travelers arriving by air to the largest international airport, Tan Son Nhat Airport will pass through the Tan Binh District, which is NW of the city Center of District 1. 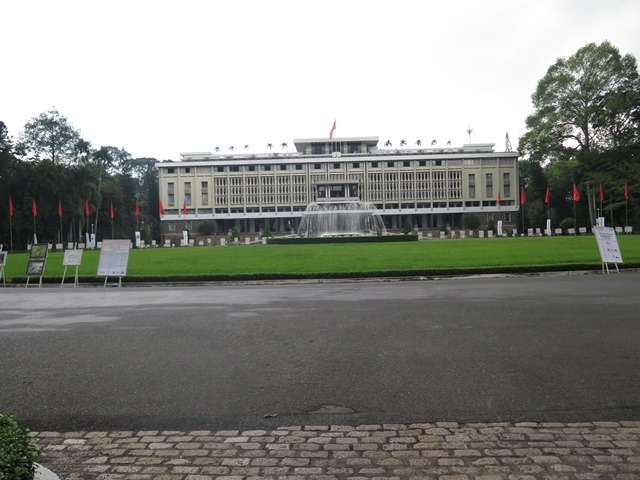 The airport, as well as the district, is linked to District 1, the Reunification Palace, by the famous Nam Ky Khoi Nghia (Southern Revolution) Street, (also cutting through District 3). Aside from the airport, Tan Binh District is also worth a visit to see the Giac Lam Pagoda, Phan Chau Trinh Tomb and Hoang Van Thu. 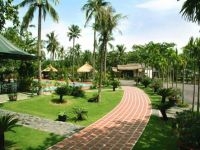 Popular Sights: Le Van Duyet Temple, San Art, and Binh Quoi peninsular fishing area/park. 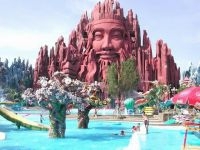 The only important tourist place here is the Suoi Tien Water Park!